A layer of ash from Mount Sinabung covered the North Sumatran capital on Sunday evening (03/07) amid increased volcanic activity in the area. National Disaster Mitigation Agency (BNPB) spokesman Sutopo Purwo Nugroho said the ash started to affect parts of Medan at around 9 p.m., causing low visibility for drivers and pedestrians. "The volcanic ash resulted from an eruption of Mount Sinabung in Karo district, North Sumatra, at 6.29 p.m. on Sunday. The eruption was only minor, but the volcanic ash that was emitted rose to 1,500 meters and the wind subsequently blew it to the east and southeast," Sutopo said late on Sunday. 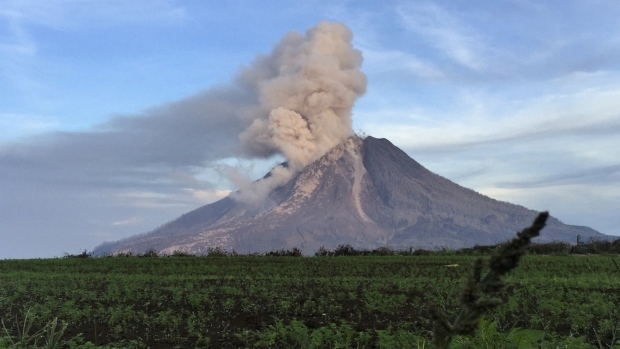 The BNPB recorded three eruptions, 10 landslides, 10 low-frequency earthquakes and two hybrid earthquakes at Mount Sinabung on Sunday. The 2,460-meter-high volcano also released incandescent lava, which flowed as much as 1,000 meters down its eastern and southeastern slopes. Residents and visitors have been advised not to go within a three-kilometer radius of the crater. "Those areas located in the red zone are a very dangerous and need to be evacuated," Sutopo said. He added that 2,592 households have already been evacuated to nine posts the agency had set up, while another 1,682 families from four villages are still being evacuated. The red zone is a very dangerous area, so nobody is allowed to enter those areas," Sutopo said.